The Star Storm bracelet was inspired by the rosetta windows of medieval cathedrals and the exquisite jewels from the past, full of preciously cut cabochons. 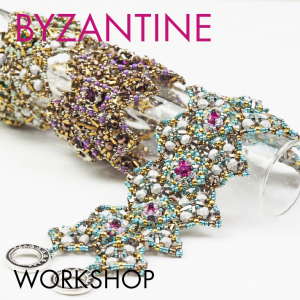 Due to the strength of the construction it feels like a several hundred year old bangle made for a real lady, but made entirely from beads! 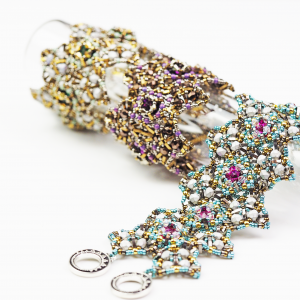 Learn to make a glamorous bracelet full of sparkle – Preciosa rhinestones and Swarovski Elements crystals come together in this luxurious design. 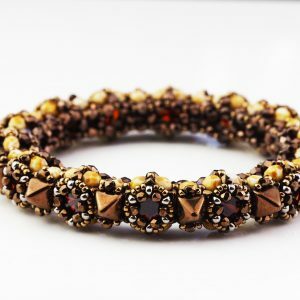 The bracelet has a sturdy construction and makes use of the new possibilities provided by 2-hole beads. 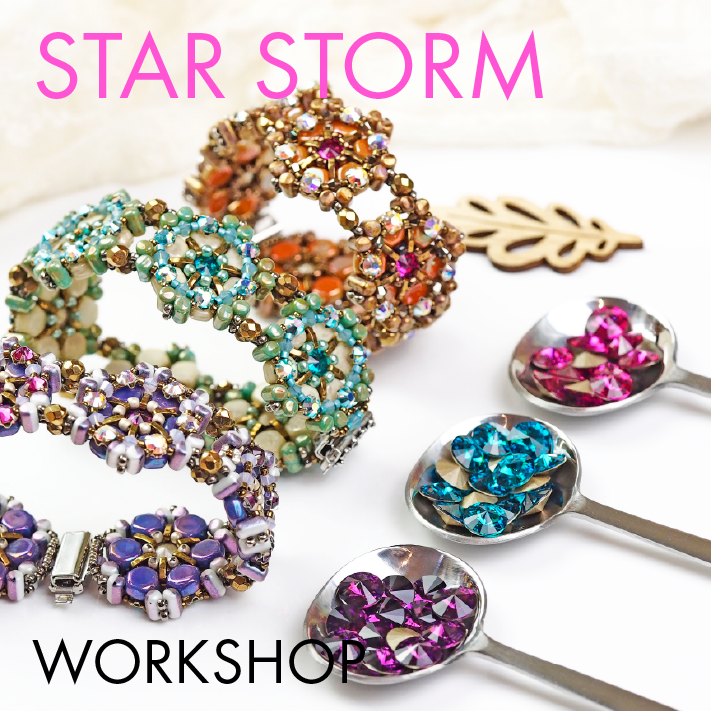 SKU: star-storm-bracelet-workshop. 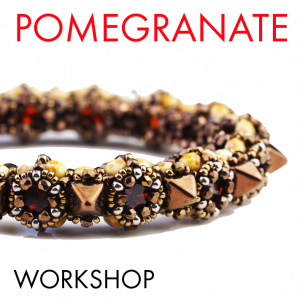 Availability: 12 in stock Size: N/A Category: Workshops. 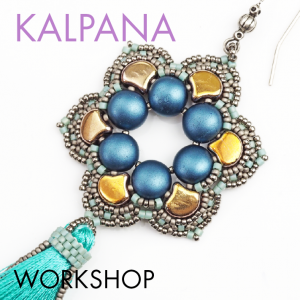 The kit contains enough material for 10 motifs (a middle-sized bracelet consists of 7 motifs so from the rest you can make earrings or a pendant by adding earring components and pendant beads). 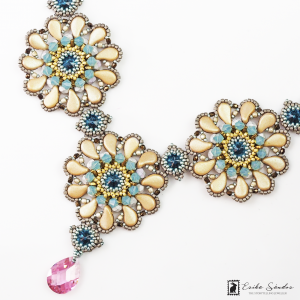 Material: Swarovski Elements cabochons, beads; Preciosa rose montee rhinestones; Czech glass beads; Claspgarten clasp; Japanese Miyuki seed beads. Please bring #13 beading needles, beading mat, Fireline 0.15 mm (8LB), scissors, task lamp, zappers. 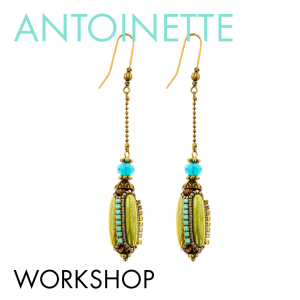 Prerequisite: experience working with 2-hole beads. You have the right to withdraw from this contract within fourteen days without giving any reason. 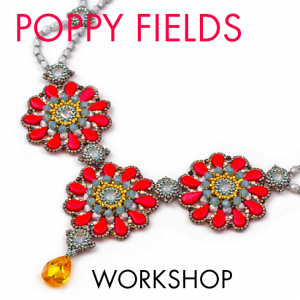 The cancellation period is fourteen days from the day on which you ordered the workshop. In order to exercise your right of withdrawal, you must inform me (Erika Sandor, Borgerstraat 143 B, 1053PG Amsterdamm, The Netherlands, erika@thestorytellingjeweller.com, tel. 0031 6 800 53 792) by means of a clear statement (e.g. a letter sent by post or e-mail) about your decision to withdraw from this contract. If you make use of this option, I will immediately send you (e.g. by e-mail) a confirmation of the receipt of such a revocation.